I'm a life long dog lover and have been sewing for nearly as long. In 2001 I decided to combine my two loves, and Howlin' Hounds was born. I started out just making snoods for long eared dogs, and over the years the collection has grown to include coats, visors, custom costumes and accessories for dog loving humans. 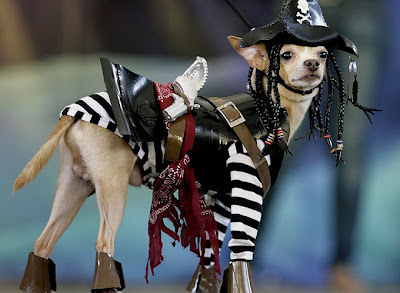 Does your dog have a great Dog Halloween Costume? Then enter the Sixth Annual PupLife.com Dog Halloween Photo Contest. If your dog’s photo is chosen, you could win a $25, a $50 or even a $100 Gift Certificate. Hand made costumes are encouraged, but store bought costumes are fine, too. Contest is open to U.S. residents over the age of 18. Sorry, international entries will not be considered. Entries must be sent via e-mail. Important: Send your photo to the following e-mail address: woof (at) puplife (dot) com. Please be sure to include your dog’s name in the e-mail and along with a short bio including the inspiration for your costume as well as your dog’s personality. Only entry per household please. Recommended image size: 575 pixels wide and no larger than 1MB per in file size. 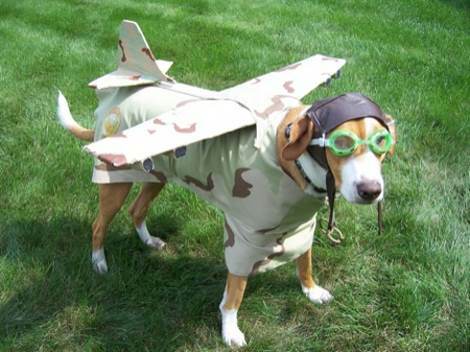 To be considered, your dog should be dressed in an appropriate Halloween costume. Obscene, lewd or cruel entries where animals appear uncomfortable or in distress will not be considered. Photographs taken by professional photographers cannot be considered. Props may be included in your photo but are not necessary. By submitting photos to the contest, you verify that you are the copyright holder for each photo submitted and have the legal authority to assign reprint rights to PupLife.com for this contest and all future purposes. By entering, you agree to allow PupLife.com to display your submitted photos and related bio information on PupLife.com, the PupLife Dog Blog, PupLife's Facebook and Twitter pages, the PupLife.com Newsletter, and any/all web sites and or projects that PupLife Inc. may build in the future. Judging (by PupLife.com) will occur on November 2nd. All entries must be received to PupLife by 5 PM (EST) November 1st. Winners will be notified via email and will be announced on PupLife.com, in the PupLife.com Newsletter and on the PupLife Dog Blog on or shortly after November 2nd, 2011. All decisions are final. Entries will be posted on the PupLife Dog Blog.